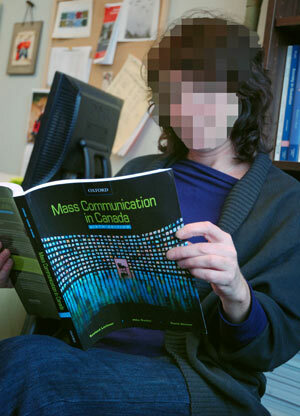 Annette Reynolds, sociology instructor at Kwantlen Polytechnic University, refused to allow her face to be published in a statement against the invasion of privacy introduced by internet technologies. The explosion of personal information on the Internet is leading to â€œFacebook creeping,â€ new reasons for being fired, and, according to a Kwantlen sociology instructor, public humiliation. â€œ[Young people are] more inclined to invade other peopleâ€™s privacy without feeling invasive about it,â€ said Annette Reynolds. â€œThereâ€™s a tendency to feel like you can cross social barriers because thereâ€™s an anonymity. Thatâ€™s a kind of cyber-bullying,â€ Reynolds said, remembering a time when she read hurtful comments on the teacher-rating web site RateMyProfessors. com. Cyber-bullying is a rising trend, according to a Microsoft Canada Youthography Internet Safety survey released in February. The survey of people from nine to 17 years old found that 40 per cent of Canadian youth had been bullied online, up from 25 per cent in 2004. It also reported that 60 per cent of youth believe people bully because it is â€œcool.â€ More than half of the 16 per cent who said they have cyber-bullied another youth said there were no consequences to their bullying. â€œPublic humiliation is a form of entertainment,â€ said Reynolds. Bullying is one of the side effects of an information free-for-all that includes blogs about peopleâ€™s personal lives, YouTube videos featuring friends, and Facebook pages full of personal info. Privacy has a different meaning than it used to. In the past, privacy was provided by default before technological advances introduced a plethora of information databases. Now that personal information is required in order to access many Internet services, people must choose between those services and privacy. â€œWhat we really want is control,â€ said Vonn. The government hasnâ€™t hesitated to take advantage of the new opportunities for control, either. Technology-based surveillance, called dataveillance, is increasing as a form of policing and is a worrisome opportunity for state control, she said. Knowing a lot about everybody all the time applies to personal relationships, too. A University of Guelph study released in August indicated that the more time a person spends on Facebook, the more likely they are to become jealous of their significant other because of overexposure to triggers. A person may become alarmed by a comment from someone saying â€œIt was great to see you,â€ become jealous, and begin â€œFacebook creepingâ€ that commentatorâ€™s profile for more information. This trend in â€œFacebook creepingâ€ leads to suspicions, just as government dataveillance does. â€œ[Data] starts to take on a reality and a life of its own… regardless of if youâ€™ve done anything wrong,â€ said Vonn. Employers are pursuing control too, said Michael Cox, who believes he was fired from a probationary bus-driver position with Coast Mountain Bus Company in January because of his blog. The costs of censoring personal information that is being published online, such as reduced freedom of speech, need to be weighed against the benefits, which include retaining a job. In todayâ€™s digital age, the ability to avoid having personal details on the Internet isnâ€™t always there. â€œThe only way to remain a truly private individual would be to only purchase using cash and to be an electronic hermit,â€ said Cox. Itâ€™s difficult to remain an electronic hermit, and one result is identity theft. Equifax Canada fraud specialist Vanessas Guillani told the Globe and Mail in June that identity theft went up 500 per cent from 1998 to 2003. Identity theft is a big problem, but personal problems with identity itself are also on the rise. People can take on various identities through social media, which can result in a loss of self, according to Vonn. Internet game Second Life, which mimics real-world activities, including earning income and building relationships, has been featured in the news as a harbinger of real-life problems. A number of game users have adopted their character and attempted to create a perfect life, only to lose their jobs, friends and family. Some have fallen in love with virtual characters only to learn that the real person was not what they expected. â€¢ Read privacy contracts, particularly those regarding health, credit-card and banking information. â€¢ Ask questions or refuse to sign things that donâ€™t seem worth it. â€¢ Consider the implications of your pictures, thoughts and videos before you post them. â€¢ Know your employerâ€™s policies concerning social media. â€¢ Remember that once you publish something online, you can never get it back.